Offering superior seat belt comfortand added protection for both expectant mother and child, while driving, thisDreambaby® Bump Belt™ gives real peace of mind! Car travel has its risks. All accidents and minor incidents can be a problem for anyone but if you’re pregnant it’s doubly dangerous as a seat belt can exert extreme pressure against the abdomen, potentially damaging the uterus and resulting in injury and even miscarriage. If you or the driver is forced to break suddenly or you experience a low speed impact from behind, you can be pushed forward with unforgiving force. Accident statistics confirm that unborn children can be harmed when the seat belt is positioned incorrectly over the mother’s abdomen. Internationally, it is now standard practice for obstetricians and GPs to advise pregnant women to wear seatbelts under their ‘baby bumps’ as opposed to across their abdomens. The addition of aDreambaby® Bump Belt™ with the specially designed non-slip dot surface can certainly prevent the lap strap from riding up, therefore reducing the risk of injury to the unborn child. There are so many things to think about when you are pregnant. As moms, even before we technically become moms, our first instinct is to protect our unborn child. The Dreambaby Bump Belt is something that probably never would have occurred to me, unless a horrible accident made it too late to think about! The felt basically protects your unborn child from injury while driving by keeping the seatbelt from going directly across your belly. And as a bonus, it adds a little cushion underneath you for some much needed added comfort! The belt was super easy to install. I actually did it without the directions (my preferred way of doing things) and then just double checked to confirm I had done it correctly! First you just lay it on the seat and connect the straps around the back of the seat and latch them together and adjust according to size. Once you sit in the seat, you simply attach the two velcro sides to your buckled seat belt to keep it below your beloved baby bump so that in the event of an accident, the pressure is on your lap and not your baby! The bump belt was super easy to install and use and gave me that added peace of mind when I’m driving that I’m doing everything I can to protect my unborn child. All moms have an ingrained instinct to protect their baby and this would make a great gift this holiday for the expectant moms out there! If you’ve got a baby or toddler at home, you’ll know what a safety nightmare it can be. You can’t even turn your back for a second without them clambering into the hall, intent on scaling the stairs, or toddling into the kitchen towards the hot oven – eek! If you’d like to take a bit of the headache out of toddler-proofing your home, you’ll definitely want to enter to win this Dreambaby Retractable Safety Gate, worth £69.99. Dreambaby, an internationally recognised child safety brand has only recently launched in Britain and this autumn is introducing its lightweight yet durable Retractable Safety Gate, which installs easily across openings of up to 140cm and is made with a mesh barrier that rolls back onto itself on the side when not in use, saving valuable space. Because it retracts back so neatly to ‘almost nothing’, it makes it easier for parents and other family members to move around the home, cutting down on trip hazards. We’ve just installed ours on the stairs and the absence of any sort of trip bar is a big plus for us as our eldest is forever whizzing up and down the stairs and we were keen to find a solution that keeps our toddler daughter safe without putting anyone else at risk. Each Dreambaby Retractable Safety Gate comes comes in white or black with two sets of mounting brackets so it can be easily moved to where it is required, which could even be in the grandparent’s house. We have put fittings at the top and bottom of the stairs, so I can use it downstairs in the day and upstairs at night – brilliant! And we’ve only had to make small holes for the fittings, so it should be easy to cover over once we’re past the age of needing gates. Apparently, it’s made of galvanized materials, so you can even use it outside. The gate also conforms to European standards EN1930:2011 and won the iParenting Media Award. You know you want one! The giveaway will close at 11.59pm UK time on 30th November 2013 and a winner will be selected at random. 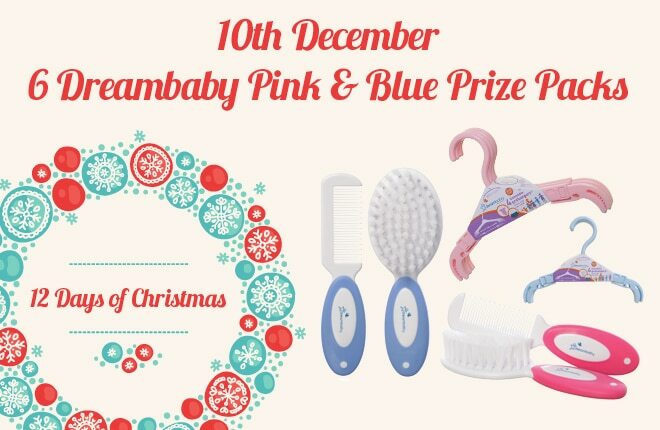 See the prize draw T&Cs – Disclosure: Dreambaby is providing this prize for the purposes of the giveaway. I was also provided with a gate for review. Please see my review/disclosure policy for more information. Listed on ThePrizeFinder – UK Competitions and Competition Hunter. There are a number of concerns for parents of babies and toddler especially when they start being able to crawl and walk and you can’t turn your back for one second without them trying to climb the stairs or sneak into the kitchen. Buying a safety gate is top of the list along with safety plugs and cupboard locks. Dreambaby® is an international child safety brand, based in Australia who have recently launched in the UK and this autumn are introducing its lightweight yet durable Retractable Safety Gate. When I was asked to review this safety gate I was rather intrigued as it sounded fantastic and I loved the concept of being able to move it around the house. 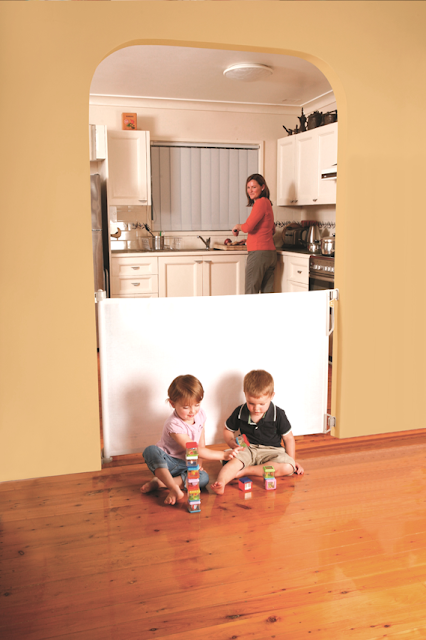 The safety gate is designed to fit across openings of up to 140cm and retracts back neatly to almost nothing! This makes it far easier for parents and the rest of the family to move around the home without a gate in the way and also cutting down on hazards. We decided to install ours in Amelia’s Nursery as we already have gates set up on the stairs and in the living room. I have to be honest and say it did take a while to put together as you require a drill which is one downside of the gate however the pro’s definitely outweigh this. The gate is made with a mesh barrier which rolls back onto itself when not in use saving a lot of valuable space! Available in a choice of white of black to fit in with your decor. We opted for white as our home is neutral. Overall I am very impressed with this gate even though I did need some help to put it up and after I finally figured out how to get the instructions out of the gate as it was wrapped up inside it didn’t take too long then to get it up on the wall. I would recommend this safety gate to every parent as an alternative to the usual frame baby gates to save space in the house. You can find out more information on the Dreambaby Retractable Safety Gate on their website and can also purchase one of your own for £69.99 here. Dreambaby are very generously giving away a retractable safety gate to one of our readers! All you need to do is enter via the rafflecopter below! This giveaway will close on December 20th 2013 and the winner will be announced on Facebook. Good luck! as they grow in confidence and become quicker on their feet, which is why it is so important to make sure that your living space is fully toddler-proof. You can’t prevent every single trip and slip as your toddler grows, but by taking a few simple measures you could help to minimise the risk of accidents in the home. Follow these tips for creating a child-friendly home and enjoy the peace of mind that your toddler can discover their world in safety. Make sure that electrical outlets are covered to prevent little fingers getting into trouble. Secure lamp cords so they can’t be pulled down, and consider removing floor lamps which can be easily tipped over. Prevent bumps and scrapes by cushioning sharp corners on furniture. Position breakable items out of your toddler’s reach. Protect fireplaces with a fire guard and store fireplace accessories out of reach. Ensure chairs are pushed right beneath the table to remove any opportunities for climbing. Move any items on the table to the centre where they cannot be reached. Fold up the corners of your tablecloth so they can’t be grabbed and pulled. Make sure razors, scissors and other dangerous objects are stored well out of reach. Add a non-slip bathmat to your bathtub. Always empty the bath after it has been used. Invest in plastic bathroom accessories rather than glass. Keep the bathroom door closed and never leave toddlers unattended in the bathroom. Hide cleaning products out of reach, preferably in locked storage. Always cook using the back burners of your hob, and point pot handles away from the edge. Store breakable objects where they can’t be found by your toddler. Keep hot drinks and other liquids away from the edge of the table or counter. Keep knives stored securely out of harm’s way. Make sure that cords on blinds are folded out of reach. Place eye-catching stickers on glass doors at your toddler’s eye level to prevent bumps. Invest in a stair gate for both the top and bottom of your staircase. Keep stairs free of clutter once your toddler begins learning to use the stairs to reduce the risk of trips and falls. Store tools and gardening equipment out of reach. Make sure chemicals and other hazardous materials are safely locked away. If your garage has an automated door, make sure that it has a safety cut-off feature. Take a good look at every area of your home to assess whether it is toddler-friendly, and you are sure to spot a few places where safety could be improved within your property. There are a number of great products on the market which are designed to help you toddler-proof your home, so shop around to find a few items to make it easier to keep your little ones out of harm’s way, and feel confident that your baby can explore in safety. Dreambaby® has some very useful PINK and BLUE products, to help your little –boys or girls – at every stage of development. Dreambaby® is dedicated to assist all new parents and carers, every step of the way, as their babies grow. Here are a few new products ranges, available in PINK or BLUE, and ideal perfect for your little one! The new Dreambaby® Deluxe Brush and Comb Set, is soft with gentle bristles, glides through baby’s soft hair and is a must-have for all new babies. The Dreambaby® Hair Comb has non-scratch, rounded teeth which will help to detangle baby’s fine hair, without tears! Available in PINK (F328) or BLUE (F327) RRP $9.95 each. The Dreambaby® new Grohangers, are a great investment, they adjust to the size of your child’s clothes and will last from birth through to older childhood. Simple pull out the strong and durable arms to adjust your Dreambaby® Grohanger! Available in PINK (F683) and BLUE (F682). RRP of $5.95 (four pack). Enter using the form below. Competition closes on Tuesday, 10 December 2013 at midnight AEDST. Please read the competition terms and conditions before entering. Check out these fantastic gift ideas for anyone on your list. With many ideas in various price ranges, there is sure to be something to fit your budget! For these and more gift ideas, also go to “Gift Guide” on the Grinning Cheek to Cheek Homepage! Tiny Love is a company I had never heard of until I began blogging and I truly wish I would have heard of them sooner. Tiny Love toys are creative, colorful, musical, and just all around fun. The Tiny Love Magical Night Mobile is both soothing and fun with options to grow with baby even up to a nightlight for bigger kids. The Follow Me Fred Puppy is fun and active with a fantastic mute option. And the My Nature Pals stroller toys is entertaining, whether in a stroller or clamped on a surface elsewhere. The toys are also well-built and I am excited to continue watching Micah play with them! The Radio Flyer EZ Fold ‘N Stroll 4-in-1 Trike is a fantastic trike that grows with your child! Girls and boys alike enjoy being active and strollers just don’t allow for the level of interaction with the world that the trike-stroller does. Everyone I meet raves about how cute it is, Micah loves riding in it, and I love that it will grow with him. Plus, Radio Flyer is a great name so I know it is a good product. The only downside was it’s extensive assembly required, otherwise it is built with safety and longevity in mind. Down to the details, if this fits your budget, it is a fantastic gift! Prince Lionheart makes some fantastic baby items and the Prince Lionheart Playmat is no exception. The two-sided foam mat is lightweight, easy to clean, and can be any combination of city, farm, ocean, dinosaurs, or alphabet. It’s great for a soft surface for little ones to play on, a fun surface for toddlers to explore and create imaginary adventures, and a fantastic learning space for preschoolers to explore to letters and more. The Playmat Plus includes a carrying case with an awesome handle, which can be awkward to carry and then hard to lay flat, but with a little breaking in, this mat is versatile and a great gift. Looking for some good stocking stuffers for a new baby, adventurous toddler, or young mom? Check out Dreambaby’s line of great baby safety products! Most recently I got the Crocodile thermometer and I love it! Micah loves baths, but if the water is too cold or hot, it quickly ruins the fun. This adorable little crocodile can float in the water and checks the temperature every ten seconds, then turns off automatically in 30 minutes. It actually came up with a temperature really quickly! It can monitor in C* or F* and can be used to check the temperature in a room or outdoors as well! Also check out other great products like outlets covers, stroller clips, and Baby on Board signs! Dreambaby creates with mom and baby in mind and would make great stocking stuffers for your family! Carolyn is currently working on a child safety book and app for all parents who may need help sorting through what seems like a mammoth task – child safety. It’s due to be completed in mid 2014 and will be full of practical advice based on her many years of working in the area of child safety and developing safety solutions for Dreambaby®. When should we start to educate children about stranger danger? From the beginning teach them about taking general precautions that will help them protect themselves. For instance when bathing them, you can say, “let’s check the water temperature, is it too hot?” Teaching children about stranger danger should not be a specific learning event, it should be a part of everyday conversation from the beginning and identified as one of the precautions they need to take to protect themselves. Choose either a very rounded cornered table that is really solidly made (NO GLASS), or nothing at all. Remember to also keep an eye on any food and coffee that you place on your table as they can be a hazard of their own. What is the most unsafe; hazardous home environment you have ever encountered? And how did you fix the problem? What can pregnant women do when driving to reduce the risk of pressure across the abdomen? Are airbags safe for pregnant women? Well, we do not have the choice of having airbags or not in most cases. The Dreambaby® Bump Belt certainly has created huge interest for our pregnant Mums. It holds the seat belt below the bump and means that should the car have to stop suddenly, then at least there is no belt crushing over the tummy. It is a very exciting addition to Dreambaby® and we are thrilled to be able to help a mother-to-be feel more comfortable about travelling around in the car, whether as a driver or a passenger. Win Twice As Big With Dreambaby®! To celebrate the launch of two new Dreambaby® products, Sunny Coast Kids are giving you chance to win, not one, but TWO “big ticket” essential safety items, perfect to ensure the safety of the little people in your home. The Dreambaby® Retractable Gate in Black (F943, RRP$89.95) is designed with all the qualities of its original white version, loved the world over! The sturdy and durable mesh barrier winds back onto itself to the side when not in use, saving valuable space. Adaptable to fit different sized doorways, hallways, stairways, passageways and vestibule areas, as well as outside areas such as decks and patios (with openings of up to 140cm), it comes with a one-handed easy opening system. The new black version is sophisticated and will be popular in homes that command stronger colour palates and also complies with standard ASTM F1004-07. Keeping children safe in the day is important, however, keeping them safe in the night, during their sleep is almost priceless! The new Dreambaby® Harrogate Bed Rail is the must-have safety item for smaller children and toddlers training in a BIG bed. As parents know, children wriggle and move a lot during their sleep so it’s important they don’t fall out of their beds, as this can be quite startling and shocking for little children. Key features include, a fold down rail for easy bed making, extra-tall 45.5 cm (18in) and extra-wide 109.2 cm (43in), breathable mesh and best of all, no assembly required! 1 x Dreambaby® Harrogate Bed Rail (F770, RRP$49.95) and 1 x Dreambaby® Retractable Gate in Black (F943, RRP$89.95).